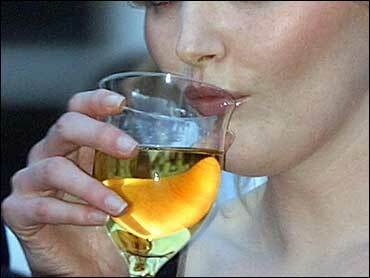 White wine fans, raise your glasses: A new study suggests the lighter wines may be just as good for the heart as red. Until now, research has suggested the bulk of grapes' heart-healthy benefits come from antioxidant compounds primarily found in their skins. These compounds are called anthocyanins and contribute to the red color of the fruit. In the making of red wines, the grape skins are crushed along with the pulp. But the skins are quickly separated out during the making of most white wines. That led to the conventional belief that red wines, which contain more of these compounds, are responsible for the drink's beneficial effects in fighting heart disease. But researchers say new evidence suggests the pulp of grapes appears to be just as heart-healthy as the skin, thanks to other types of antioxidants present in the flesh. This challenges the notion that red wines, like cabernet sauvignon, merlot, and pinot noir, are better for the heart than white wines, such as chardonnay, sauvignon blanc, and Riesling. In the study, published in the Journal of Agricultural and Food Chemistry, a group of American and Italian researchers compared the effect of feeding laboratory rats water or equal amounts of grape pulp extract, or grape skin extract for 30 days. The results showed both extracts were equally effective in protecting the rats from induced heart attacks. Rats fed either grape skin or grape pulp extract had significantly smaller heart attacks compared with those fed water. In addition, tests showed both extracts appeared to have the same level of antioxidant activity. Researchers say the grape skin extract did contain high levels of anthocyanins — part of a class of antioxidants known as polyphenols. The pulp extract did not contain anthocyanins; but it was rich in other types of polyphenols. "Although further study is needed to identify the principal ingredients responsible for the cardioprotective abilities of the grape flesh, to the best of our knowledge, our study provides evidence for the first time that the flesh of grapes is equally cardioprotective with respect to the skins," writes researcher M. Falchi of the University of Milan and colleagues. SOURCES: Falchi, M. Journal of Agricultural and Food Chemistry, published on Web site, Aug. 4, 2006. News Release, American Chemical Society.